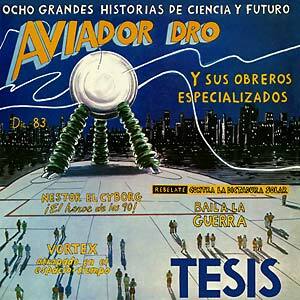 "Espacial Discos present a reissue of Aviador Dro's second album, Tesis, originally released in 1983. In 1983, Aviador Dro, the legendary Spanish synth-pop band, are at the height of their powers: their own DRO record label is working full time, they share management with famous Spanish new wave bands like Alaska y Los Pegamoides, Los Nikis, their songs are heavily played on the radio and they play numerous gigs all across Spain. 1983 was also when the band decide to create their most ambitious project to date: a deluxe box set, Síntesis: La Producción al Poder, which will include two LPs, a 7" and a booklet. It was as a part of that set where Tesis, which would become their second album, originally appears, along with another album, aptly titled Antítesis, showing the more experimental side of the band. A few months after the release of Síntesis: La Producción al Poder, Tesis was released separately with a slight change to the track list. This is the edition presently being reissued. Subtitled "Eight Great Stories Of Science And Future", Tesis featured "the most recommended songs for the industrial dance". This is, simply put, another minimal wave/synth-pop classic, including anthems like "Baila la guerra", "Vortex", and "Nestor el cyborg". Remastered edition with original artwork and eight-page LP sized insert." HIGHLY RECOMMENDED!